After over 8,000 votes were cast, Ryan Dunne has come out on top and is the Offaly Express/Guy Clothing Sportstar of the Month for June. Ryan is our youngest winner yet and he came out on top with 27% of the votes cast. The Tullamore Harriers All Ireland winning U-20 4x400 relay team came second with 14% of the vote while archers Gerard and Olivia Eady came third with 13% of the vote. 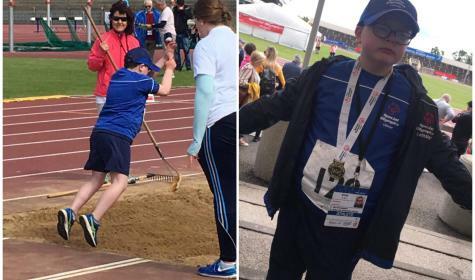 As one of the youngest athletes on Team Leinster for the recent Special Olympics Ireland Games, Tullamore's Ryan Dunne was a brilliant winner of a gold medal in the standing long jump event. At just 10 years of age, Ryan has having his first games and proved himself to be a class act.